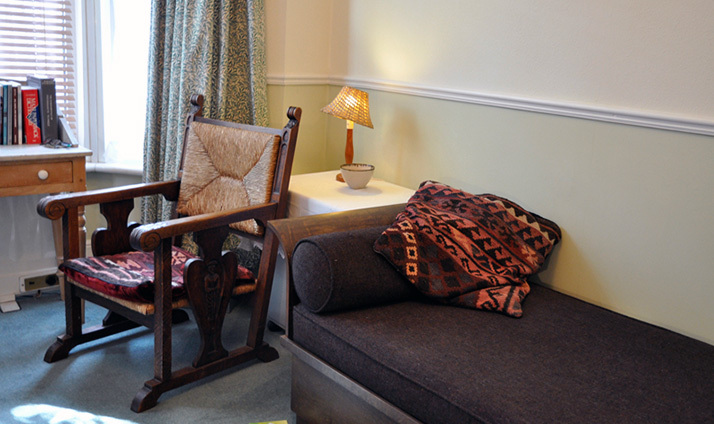 The therapy we offer at the Inner City Centre is psychoanalytic psychotherapy. Psychoanalytic psychotherapy involves conversations with a listener who is trained to help you make sense of and change, things that are troubling you. It is a process in which you are actively involved and have choices. There is clear evidence that psychotherapy can reduce the incidence and severity of depression and other mental health problems. But its role is not limited to this. People come to us because of many kinds of problems and difficulties in living. Usually they know or suspect that these are emotional or psychological in origin. For some of the things that can indicate psychological distress and some of the events that can trigger this, see ‘When Psychotherapy can Help’. You can refer yourself to ICC by contacting us by phone or email - go to ‘Contact Us’ on this website. Read more at Clinical Services & Referrals. This is an opportunity to discuss your needs and difficulties, to see how you feel about working with this therapist, to get a sense of what therapy is like, and to ask any particular questions you may have. You can discuss whether psychotherapy could be useful to you or whether another kind of therapy would be more suitable. There will also be time to consider the practicalities of your situation and make some decisions about how to proceed. It is important for people in therapy to pay what they can afford, as this is related to the value we place on our therapist and on ourselves. At the ICC we operate a sliding scale of fees, with a system of fee bands. The Referral Therapist will discuss with you how much you can afford to pay and will assign a provisional fee band. You and your therapist will then agree the fee at the first session. Fees may be reviewed periodically through the therapy. Sessions normally last 50 minutes and are held in the same place, at the same time each week. They may be once weekly or from 2-5 times weekly. The frequency that you attend will depend on your wishes, your therapist’s availability, and the frequency that you both judge will benefit you. It is very difficult to say at the outset how long a therapy may last as this will relate uniquely to the individual and their particular needs and aims. It is a process that develops at its own pace. Sometimes people come with a very definite and particular difficulty to work on, and it may be that only a few sessions will be necessary in order to get the problem into some perspective again. Sometimes what may seem like a limited problem may turn out to be related to longer-term difficulties, for example, bereavement may bring up wider issues about loss and relationships. Freud called this therapy ‘the talking cure’ and the name still applies. This is because in therapy you are encouraged to talk as freely as you can, letting your mind associate to what you have already said. This is often hard to do at first because we are not used to it, but it gets easier. You can talk about anything - experiences, dreams, fantasies, wishes, anxieties, feelings, thoughts and memories. Your therapist listens carefully to what you say, and how you say it. They try and understand the underlying forces in your mind that make you react as you do. At the core of the process is the relationship with the therapist. Your therapist is likely to pay particular attention to the relationship that grows up between the two of you, because this helps you learn how your relationships function. It is always, essentially, the individual’s decision when to finish their therapy - when they have resolved the issues they wanted, or have done as much as they can at the time. The person will then discuss this with their therapist. A suitable period for ending can then be agreed – time enough to think about the individual’s situation, to consider the forthcoming ending, and to bring the therapeutic relationship to a close. The process of ending will quite often bring up issues which have not emerged before and time may need to be allowed for these things to be considered as well.